Thanks you. 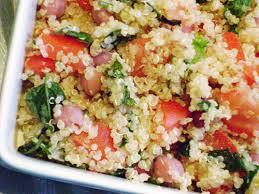 I’ve been looking for a yummy Quinoa salad recipe. One with lots of flavour. This sounds great. I love these kinds of salads too – perfect for summer, at home or on a picnic. Love quinoa recipes, can’t wait to try this one! Chick peas might be a good add for some protein!